How Remote Can We Go? Quinhagak, Alaska! How remote can we get for our projects? 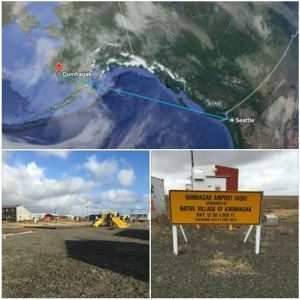 One of our most recent hazardous materials surveys was for an old school building site in Quinhagak, Alaska which is approximately a mile from the Kuskokwim Bay of the Bering Sea. In addition to Quinhagak, EHSI has worked on a number of projects throughout Alaska including: Anchorage, Fairbanks, Juneau, Dutch Harbor, Tok Junction, Cooper Center, Dillingham, Eagle River, Fairbanks, Homer, Ketchikan, Kodiak, Kotzebue, Nome, Prudhoe, Seward, Sitka, Soldotna, Unalaska, Valdez, Wasilla, and Yakutat. Services provided have included hazardous materials management, indoor air quality testing, underground storage tank assessments and closures, Voluntary Cleanup Program support, and soil vapor extraction well removal. This entry was posted in Hazardous Materials, News, Projects and tagged Alaska, Remote by Nancy Yee.